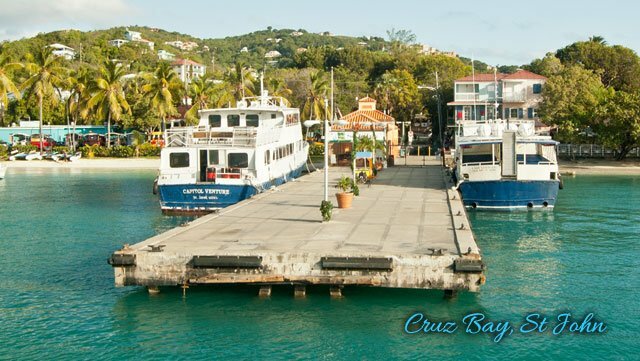 St Thomas / St John Ferry schedule, taxi and transportation information. NOTE: While we make every effort to maintain the accuracy of the ferry schedules – always consult the ferry operator when making your travel plans. The departure and arrival times and prices listed here can change without notice. INFORMATION: Ferry time is approximately 45 minutes. Commuter books are available upon request and are non-transferable and void if detached from book. Cash or travelers checks are accepted only. *You must present a V.I. Government Senior card to enjoy the discount. *If bags can fit in your lap you will not be charged and you will be responsible for carrying them. Remember: The description for a carry-on bag for the V.I. Ferry is not the same as regulated by the airlines. INFORMATION: Ferry time is approximately 20 minutes.